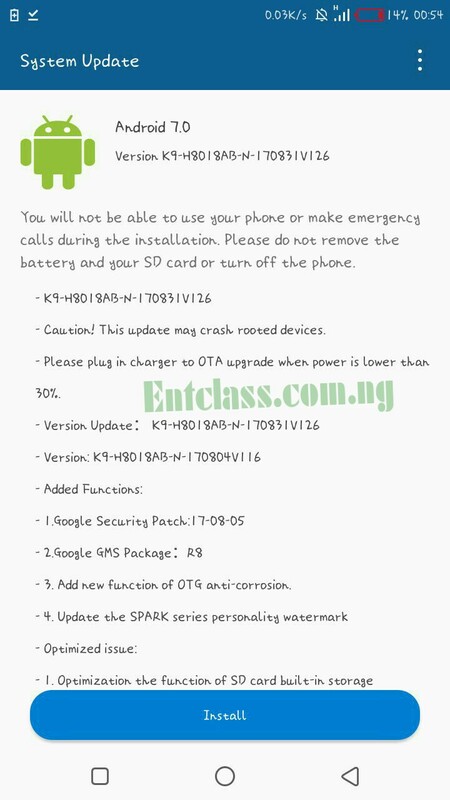 Tecno has rolled out a small update to the Spark K9 to fix some bugs which some users has been complaining about. The update is weighing in at about 21.5MB. The update fixes issue where after unlocking the phone with fingerprint sensor, the phone will take the user back to the previous window. Optimization of SD card built-in storage capabilities. Optimization of Arabic translation problems. Updated the Spark series personality watermark. Added new function of OTG anti-corrosion. Make sure your phone is charged to at least 70%. If the battery is lower than 30%, kindly plug in your charger. Also make sure you are not rooted. Kindly unroot your device if it's rooted. Go to Settings > About Phone > System Update > Tap on “Install” to upgrade your phone. That a good news from tecno. 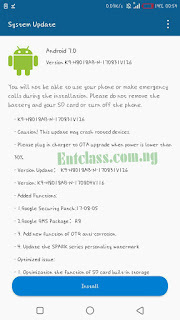 this is good, it will atleast help the people using the phone.